Arripidae are medium to large planktivorous and carnivorous schooling fishes. Bonnetmouths are midwater fishes occurring at depths of 100-500m. They are common but not abundant enough to be commercially important. The kahawai has a solid body with strong swimming muscles. It swims fast and hunts small fish. It occurs in small schools of ten to hundred and also in large schools of thousands. They grow surprisingly old. The kahawai is a streamlined inshore pelagic fish that normally ranges in size from 40 to 60cm. However, in the far north of New Zealand exceptionally large specimens are sometimes caught that may be up to 1m in length and weigh 15Kg. These individuals are often mistaken for kingfish. 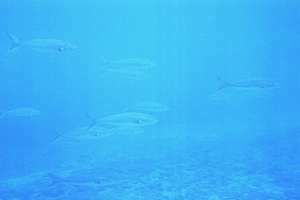 These fishes are fast swimming active carnivores which feed primarily on smaller fishes such as anchovies and yellow-eyed mullet, although they will feed on euphausid crustaceans when these are abundant. Whenever terns and gannets gather to feed in inshore waters the characteristic swirls and fin flickers that indicate feeding kahawai will be seen beneath them. Rapid moving schools of this fish are often seen by divers ghosting past at the limit of visibility. Young kahawai are often found inside estuaries where they hunt anchovies in murky waters. In the coastal seas, kahawai often mix with trevally and are thus caught as a by-catch of purse-seining for trevally. The adult kahawai swim very fast and don't appear to have any enemies but dolphins. Fishing: These fish are strong fighters and will take any type of moving lure when they are feeding. On light tackle they are an exciting fish to catch and will leap from the water repeatedly in attempts to throw the hook. About 800 tonnes are caught annually in New Zealand by commercial operators, mostly in purse seines. Few fish take bait as readily as the kahawai. Its bite is not slashing like the chop of a tailor, but deceptively fumbling. When a kahawai is hooked it becomes an exciting acrobat. 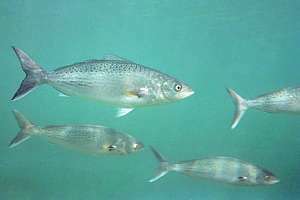 Because of its partiality to small fish it can be induced to take artificial lures and large numbers are taken by spinning in the surf or from the rocks, or by trolling from boats. Western Australian south coast 'salmon' feed principally on immense schools of mulies or blue pilchard which mass in the Great Australian Bight each autumn. Kahawai landed by anglers at Bremer Bay often disgorge masses of freshly swallowed mulies (mullet)—which can then be used again for bait. 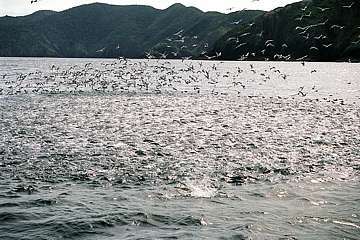 Sometimes as many as thirty baits may be retrieved from a single 'salmon'. Bait casting with ganged hooks and mulie bait is the favourite method of catching salmon in Western Australia. Professional bait fishermen catch the mulies in Albany Harbour and snap freeze them into packets of six. The mulie weighs a little under 2 ounces and is best cast in still conditions or with a following breeze. In windy conditions a surf sinker is used. The salmon, though it prefers a mulie to most other baits, is far from being a fussy feeder. The kahawai is not a popular eating fish. Its flesh, unless treated properly, is strongly flavoured and stringy, but it improves vastly when canned. Western Australian Country anglers take home salmon by the hundredweight to preserve in domestic bottling outfits. The kahawai's flesh goes off quickly because of some enzymes it contains. It pays to kill the fish quickly and mercifully by spiking its brain, rather than to let it fight itself to death while suffocating. It also pays to bleed the fish. When cooked fresh, kahawai is delicious. It is also irresistible when smoked fresh. Description: Kahawai are firm, silvery fish with a rigid body. Their backs have black spots or ripple patterns. Young fish up to 25cm have in addition, vertical rows of spots below the lateral line. They are easily distinguished from similar sized kingfish by the high spiny dorsal fin that is joined to the soft rayed portion of the fin. Kahawai vary from grey-blue to blue-green above and are silvery beneath with scattered dark grey spots on the back and flanks. They lack the yellow stripe and yellow fins characteristic of the kingfish. These fish can grow up to 75cm in length, weighing up to 9 kg, but their average size is 40-50cm and 1-2kg in weight. Kahawai have surprisingly soft lips which can be ripped easily, thus losing the fish from the hook. Both the jaw and pharyngeal teeth are hooked for seizing and holding prey, which is then swallowed whole. Fins: D VIII 14; A III 10; P I 5; large scales. Life history: Kahawai feed mainly on pelagic crustaceans when young, moving to a diet of mainly fish when old. But they also feed from the bottom, on crabs, worms, and shellfish. Kahawai make lengthy migrations, probably associated with spawning and seasonal changes in the abundance of food. They cover vast distances quickly because of their speed. This makes them impossible to protect by means of marine reserves. Preliminary studies have shown that these fish spawn in warm shallow water during the summer months of March and April, and huge schools move into coastal waters at this time. Mass spawning occurs in mid-water, in late spring and summer. The egges which are almost 1mm in diameter, are found in surface waters during summer. The eggs have a sculptured chorion and a non-segmented yolk which contains a single oil droplet, 0.25mm in diameter. Embryonic development is rapid and the larvae hatch within 40 hours of fertilisation. No information is available on the period of juvenile settlement. During the winter kahawai are more common in deeper water further offshore and they may be trawled in up to 100m of water during this season. Kahawai become up to 26 years old, which is surprising for an organism of this size and such an energetic lifestyle. Distribution: They are common all around the North Island and are also found in southern Australia. Diver tales: Kahawai behave like the ghosts of our seas. One moment they are there in thousands, encircling you at high speed. Then they collectively decide to disappear. They appear to be sensitive to the noises a diver makes because they will come from hundreds of metres away to investigate. Their counter-shading is so effective that they become invisible long before disappearing out of view as the photo shows. Fishermen don't like kahawai because they bite much sooner than the elusive big snapper and they are but 'bait fish'. The unwanted kahawai is then discarded in a hard-handed way, left to die on the rocks. We have observed how fishermen let ten kahawai come to grief in order to catch one snapper. When hunting for small fish or krill, kahawai employ a herding technique that they themselves may be unaware of. As shown in the picture below, kahawai drive the prey to the surface and then gobble them up while poking their backs high out above the water. There is a tremendous pushing and shoving between them. Kahawai coming from behind, dive underneath the frenzy, only to surface before the others. Those falling behind, repeat the pattern. In this way, kahawai become a live net that rolls around underneath the surface, continually driving the prey to the surface. The whole school can move forward in this manner at a tremendous speed of between 7 and 12 Km/hr, much faster than one could walk (if one could walk on water). Sea birds, familiar with this behaviour, await the school at the surface, joining in the frenzy whenever they can. 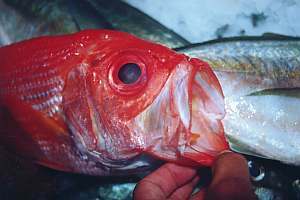 The red bait is a round bodied elongate fish that averages from 15 to 25cm in length and attains a maximum size of about 36cm, At the tip of the pointed snout is a large extensible mouth with flexible toothless jaws, ideally suited to selectively gulping down the larger planktonic animals. The dorsal fin is divided into two parts, roughly triangular in shape, with four short separate spines between them. Small firm scales cover the body and there is a large scaly process at the base of each pelvic fin. Red bait are silvery in colour with blue tints on the back and a broad pink stripe on the head and flanks. The fins are pink and the tail is pink-red. These fishes are found in midwater near the outer edge of the continental shelf and are trawled in depths ranging from 100 to 400m. In Australia they are frequently found swimming with pilchards. They have been recorded from New Zealand. Australia. South Africa. and other parts of the South Pacific. The ruby fish is related to the kahawai. It has a deep red colour and lives in midwater depths of 200-500m along upper continental slopes. Its body is elongated and ranges in size from 25-35 cm. It has a deeper body than the red bait and has a single dorsal fin rather than two separate portions. Its clolour is a uniform dark red, with a small yellow spot on each scale, sometimes giving the fish an orange tinge. It is reasonably common, being fished in trawl nets, but little is known about its habits and behaviour. This fish is also found in Australia and South Africa. Its flesh is firm and tastes good. The red ruby lives in an environment where food is scarce. With its large eyes it can see in the almost entirely dark waters. It can extend its mouth considerably for catching small fish living there.